This front suspension seems to be the precursor to early springer motorcycle forks. The beefy springs allowed the front wheel and forks to move upward and absorb some road shocks. Those old bike designers tried a lot of ways to cushion the ride of the safety bike on the rough roads found at the end of the 19th century. Here is a different way to employ springs on the front forks to cushion the ride. The Lallement Bicycle, first U.S. bicycle patent, first crank drive bike. The crank is such a simple device that one could assume it is as ancient as the wheel. The function of the crank was performed in the ancient world by handspikes which would be inserted in holes to move a capstan, and moved periodically to new holes around the cylinder of the capstan. In about the first century AD cranks were used on Roman medical devices, but it was not until 850 AD that proof of a crank in Europe is found, in a picture of a man sharpening a sword on a grindstone turned by a crank. Other references show the crank in use in certain regions by about 1100 AD, and use in a variety of tools in Europe was widespread by 1600 AD. Of course, the Chinese had used the crank since 100 BC. The Frenchmen Pierre and Ernest Michaux added cranks and pedals to the existing form of the bicycle, by adding them to the front wheel in 1861. Some people believe that this modification of the Dandy Horse makes the Michaux brothers the inventor of the bicycle. However, the version made by John Starling was much closer to the modern version of the bicycle, and most people credit him with the invention of the modern form of the bicycle. Other contenders for earliest bicycle invention include Kirkpatrick MacMillan in 1839. 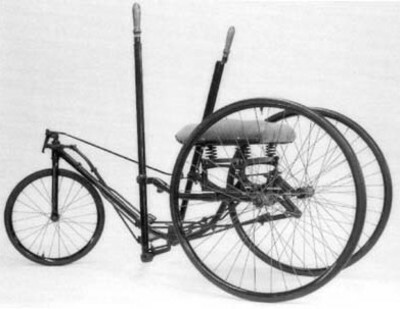 The Michaux brothers partner was Pierre Lallement, who may also have been the original inventor or collaborator in the crank powered bicycle. Lallement immigrated to the U.S. and got a patent on his crank powered bicycle, which was the first U.S. patent on a bicycle, in 1866. Machinist George Singer of Coventry England left his job at the Coventry Machine Shop of James Starley to form the Singer Cycle Company in 1875. He manufactured sewing machines, safety bicycles and patented a bicycle fork in which the ends of the fork were curved. This improved steering, and made for a smoother ride, because the forks would absorb some of the shock from rough roads, rather than transmit the shock to the handlebars. The model below was a dual propulsion bike, being propelled by arms and legs. Singer also made a motorized wheel that replaced the wheel of a bicycle, and later made motorcycles and sporty little automobiles.